The advanced driving test is a qualification for motorists who can drive to a skill level substantially above average, and candidates who pass are called advanced drivers. It is available from several societies, including the Institute of Advanced Motorists, Royal Society for the Prevention of Accidents, the Driving Instructors’ Association DIAmond Advanced Test and the British Motorcyclists Federation (BMF) Blue Riband. There is no single “advanced test”, so standards do differ depending on the provider, but all are derived from Roadcraft, the Police system of car control. It does not affect the driver’s own licence. The test is mostly (but not exclusively) UK based, and is available for several types of vehicle including car, motorcycle and commercial depending on the provider. All candidates need lessons before the advanced test. They may be provided by local groups as with IAM. The IAM advanced test is based on the IAM’s own book (How To Be a Better Driver) and Roadcraft, the Police driving system. It was introduced in 1956 to improve driving standards, following principles set out by the Metropolitan Police. It is open to anyone who has passed the standard driving test, but only a small fraction of drivers choose to have advanced driver training or take an advanced test. Examiners all hold a Police Advanced Driving Certificate. The test covers approximately 1 hour and 40 minutes on different types of road, from town to country, city and motorway. Associates will have trained in all areas and have to demonstrate the techniques and methods they’ve learnt. Some insurers will offer reduced vehicle insurance premiums to holders of an advanced certificate. Chesterfield Group of Advanced Motorists was formed as a sub group of Sheffield Group in early January 1976. The inaugural meeting was held at the Chesterfield Hotel with the first committee meeting being held at the secretary’s house in Lockoford Lane on 21st January. The group membership fee was set at £1 per member. In April 1977 the 50th full member joined the group allowing it to gain full group status that meant the group existed in its own right. The group membership runs at around 100. We have been involved in a number of fund raising activities from a mile of pennies on the Chesterfield By-Pass just before it opened, to jumble sales and of late some very successful auctions that have been held after the AGM. The Group has also been involved in many local activities including marshalling the local Cyclist of the year competition, running the Driver of the Year and manoeuvrability competition and delivering Christmas Hampers. Also for a number of years we were the North East Derbyshire Road Safety Winners. Both group and committee meetings have been held at a number of venues over the years including the Highfield, the Hollingwood, the Devonshire Arms Hasland, the Railway at Whittington Moor and Bobbies Café at Cutthorpe. Committee meetings have been more static of late and have been held at the Central Library for many years. Social nights by comparison have moved around every few years and in the recent past have been from the central library, to the Boythorpe pub, a spell at the Markham Arms New Brimington and have now returned closer to the town centre at the Chesterfield Club, Ashgate. Guidance originally operated as mass sessions on a Sunday from the car park outside the old Royal Hospital but have again moved in location over the years. From 1992 we were in the Soresby Street car park but when re-development of the area took place we moved to the health club on Sheffield Road and latterly the Sainsburys Car Park which has proved to be an ideal venue, both in terms of access and space to advertise ourselves – thank you Sainsbury’s. 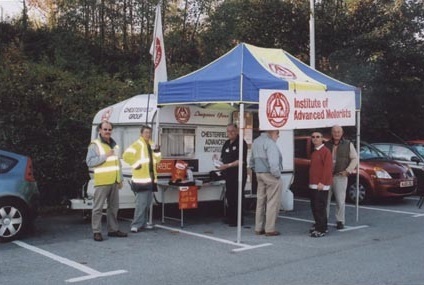 To provide shelter for the observers and candidates we purchased our first caravan in 1983 and we have had one ever since. We became a charity in our own right in 1993 that enabled the group to make better use of subscriptions and donations. The group celebrated its 30th anniversary in 2006 and hopefully will be as successful over the next 30 years.